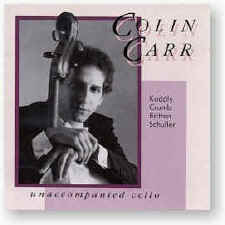 One of the most respected and acclaimed younger cellists, Colin Carr is the winner of many prestigious awards including First Prize in the Naumburg Competition, the 1990 Grand Prize in the Rostropovich International Cello Competition and the Piatigorsky Memorial Award, among others. In this extraordinarily ‘present’ high fidelity recording, Carr’s razor sharp playing cuts straight to the heart of the matter. From the very beginning (the almost frightening first notes of the Kodály) to the very end (the declamatory, emphatic conclusion of the Schuller Fantasy), the soaring sound, performance and range of this program combine to stake a claim for Carr as one of today’s truly important cellists. Recorded 16 September, 22 and 24 October 1990 at Methuen Music Hall in Methuen, Massachusetts.